Innovating Minds: The Advantages of "Playful Learning"
The Advantages of "Playful Learning"
Summertime is upon us, which gives many pre-school and schoolage children an increased opportunity to pursue one of their favorite activities: play. 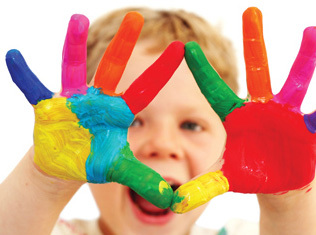 As we mention in our book, Flourishing in the First Five Years: Connecting Implications from Mind, Brain, and Education Research to the Development of Young Children, it’s hard to overstate the importance of free play and more directed “playful learning” to support the development of young children’s language, problem-solving, social, and creative abilities. Young children play with various toys that teach them how to sort objects by shape or color, how to stack, how to count, how to say the letters of the alphabet, and how wheeled objects can go from point A to point B. When playing with others, they learn the concepts of sharing or taking turns—though perhaps not always willingly at first. As they grow older, they learn such concepts as problem solving and perseverance. A determined 4-year-old may get discouraged when her block tower keeps falling down, but she doesn’t give up, figures out a better way to build it, and the sixth time she tries—success! Thus, play provides many paths to mastery. As neural development proceeds in infants and young children, the range and complexity of play increases quickly. Research shows that play has a significant role in healthy development, with evidence that it facilitates linkages of language, emotion, movement, socialization, and cognition. There are various types of play, the most significant of which is “social play.” Social play often involves pretending. A group of children playing “house” or pretending that a cardboard box is a spaceship to the moon are two examples of social play. When I was a child, I remember engaging in pretend play of “being the teacher” and helping other children learn how to read. This was before I even began attending school, and it turned out to be a way of acting out a desire that eventually led me into the field of education. Research indicates that active play may contribute to continued development of a child’s motor skills as well as to cognitive development, socialization, and improved attention to learning tasks by young children. Therefore, we recommend that parents, teachers, and caregivers put considerable attention into encouraging and leading young children in active play with the knowledge that it may well pay off with lifelong dividends. Aamodt, S., & Wang, S. (2011). Welcome to your child’s brain. New York, NY: Bloomsbury. Centre for Educational Research and Innovation (Eds). (2007). Understanding the brain: The birth of a learning science. Danvers, MA: Organisation for Economic Co-operation and Development. Hirsh-Pasek, K., Golinkoff, R. M., Berk, L. E., & Singer, D. G. (2009). A mandate for playful learning: Presenting the evidence. New York, NY: Oxford University Press. Murray, B., & Fortinberry, A. (2006). Raising an optimistic child: A proven plan for depression-proofing young children—for life. New York, NY: McGraw-Hill.